Two weeks ago I went to a Dongbei (or Northeastern China) restaurant in Flushing for lunch with a group of Chinese food enthusiasts. I glanced through the menu, but like many seasoned Chinese diners I asked the owner if they had any special seasonal dishes from the kitchen. As it turned out they had young tender garlic scapes, which are the stalks of garlic blossom, and she suggested we ordered them stir-fried with pork slices. I was thrilled to know they’re still available during this late in the season. Chinese cooks utilize many parts of the garlic plant. Young garlic shoots are used in classic dishes such as Twice-Cooked Pork, garlic scapes are used as vegetable in stir-fries, and mature garlic greens are often used to flavor beef or lamb stir-fries. Of all the parts of the garlic I specially love garlic scapes. They are tender and have very mild flavor. Garlic scapes are excellent for stir-fry dishes as they don’t compete with stronger flavored ingredients, but rather complement them with a sweet succulent character. Although garlic scapes (蒜薹, 蒜芯, 蒜苗) have been consumed in Asia and France for years it is only recently that Americans have become aware of them. They’re now ubiquitous in farmers market during the spring all over the U.S. Unfortunately they have a very short season, and are available only from mid-spring to early summer. Obtaining them requires vigilance during this brief period. 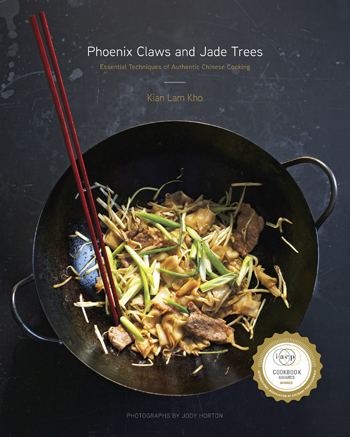 The most common use of garlic scapes in Chinese cooking is in stir-fries. Classic preparations often paired them with pork, Chinese smoked bacon and beef. They are sometimes stir-fried and scrambled with egg as well. I decided to introduce you to a vegetarian garlic scape dish that I served a Buddhist friend of mine at a recent dinner. 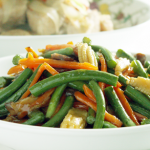 In this recipe I combined garlic scapes with carrots, baby corn and shiitake mushrooms. I finished the dish with a little bit of rich savory soy based sauce to coat all the ingredients. When ordering food in a Chinese restaurant in Asia it is common practice to inquire about the availability of seasonal ingredients. In fact many restaurants, especially those away from cities, do not even have menus. The owner or server will recite a list of available fresh ingredients, and then suggest a cooking preparation that the chef would recommend. So next time when you’re in a Chinese restaurant ask away. You might encounter some delicious and exotic dishes not on the menu. Reconstitute the dried shiitake mushrooms in a bowl of hot water. Cut the garlic scapes into 2 inch sections, discarding the flower buds, and set aside. Julienne the carrots into about 1/8 inch thick pieces and set aside. Cut each baby corn in half on the bias and set aside. Cut the shiitake mushroom into 1/8 inch thick strips and set aside. Mix the vegetarian stock or water with light soy sauce, sugar, cornstarch and ground white pepper in a small bowl. Set the sauce mixture aside. 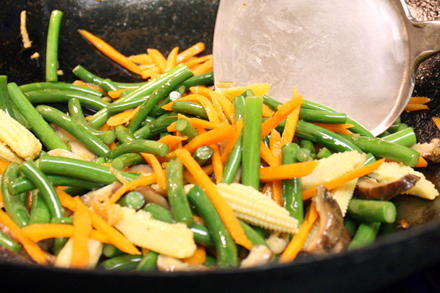 Heat the vegetable oil in a wok until just about reaching smoking point. Add the garlic and ginger slices and stir-fry for about 30 seconds. Add the carrot slices and garlic scapes to the wok. Pour the cooking wine into the wok and stir-fry for about 30 second. Cover and let the vegetables steam in the wok for about one minute. 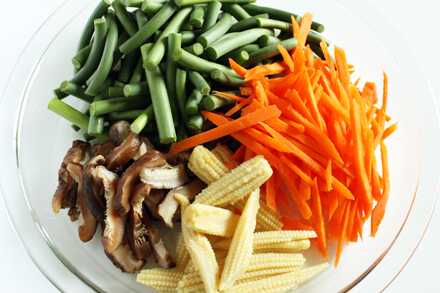 Uncover and add the baby corn and mushrooms and continue to stir-fry for another 30 seconds. 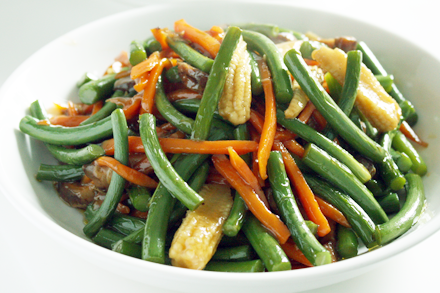 If the vegetables are dry when stir-frying, then add an additional 1/4 cup of vegetable stock or water. Pour the sauce mixture into the wok and let it thicken. Plate the vegetables and serve immediately. Thanks for posting this! I walked into my local Chinese market today, to buy some tofu, & saw that they had garlic scapes, so I’ll try stir-frying them this week. That’s right, most markets do not know how to label garlic scapes properly. Garlic sprouts, garlic shoots and garlic greens are often used interchangeably. Although there are many different parts of garlic available in Chinatown and they should all be labeled accordingly. Even in Chinese there are many different names. 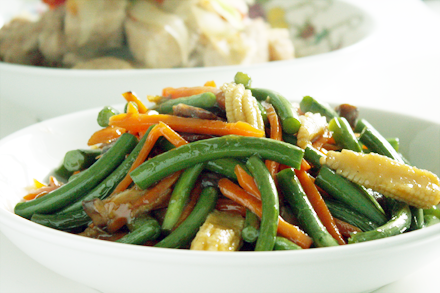 In northern China the name suan tai (蒜薹) is used most commonly for garlic scapes. But in the south suan xin (蒜芯) is used. But sometime suan miao (蒜苗) also refers to garlic scapes in spite of the fact that suan miao often refers to garlic greens, or the leaves. So I’m as confused as you are. I’m afraid you’ll have to look at the item itself. Garlic scapes are round solid stalks and usually have flower buds attached. Garlic greens are usually just the leaves with white parts at the bottom. Thanks for sharing this recipe! I am expecting a delivery of garlic scapes from my farmers market and this gives me some great ideas! 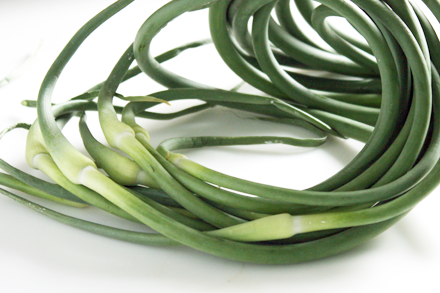 Garlic scapes are wonderful in stir-fries, thinly sliced raw into salads, processed into pesto, pickled, you name it! I think I’m going to go cut a few from my garlic planting right now! You know why I love garlic scapes? Because they taste just like garlic (okay a little milder) and you can chop them so much easier! I can not get over how tasty that looks. I just ate lunch and I’m hungry again for this stir fry. This is a wonderful site and I would like to add it to my blogroll, if you don’t mind. Born in China, raised in Taiwan, grow my own Chinese veggies here in NH. It’s the best way to get them. Look for the mention of Red Cook! Yes, garlic scape has very short season and they are truly delicious. Thanks for the mention. Garlic Scape, Allium Sativa, is the flower stalk of the garlic plant. At the end of the curl is the start of its flower bud; the other end is just the cut where the stalk was removed from the plant. Bolting and flowering of the flower stalk usually happens in our northern August summer. In stores it is often confused with another onion, Allium Tricoccum, commonly called Ramp, or Wild Leek, which is harvested in our April springtime. It has a three-leaved shoot with a small white bulblet at its base. Both of these delicious, edible herbs have a short shelf-life, and are available about three months apart.